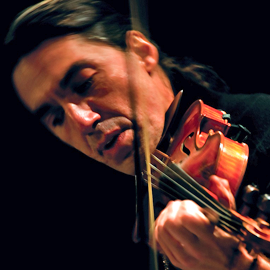 Violinist NICK DANIELSON enjoys a versatile career as a classical and Tango musician. He is the assistant concertmaster of the New York City Ballet Orchestra and was a longtime member of the Orpheus Chamber Orchestra. He can be heard on many of Orpheus recordings, including Stravinskys Concertino on the Grammy winning CD, Shadow Dances. Nick has toured and recorded extensively as a soloist and chamber musician, and with numerous Tango ensembles. His latest recording with Otero, Vital ( World Village ) won the 2010 Latin Grammy for best classical album. Among his most recent collaborations, he has performed with pianist-composer Fernando Otero, sax master Paquito DRivera, and Tango legend Pablo Ziegler. Nick received his training at the Curtis Institute of Music with Ivan Galamian, after which he spent five years as first violinist of the Chester String Quartet. He has made New York his home since 1988.